Physicists led by Professor Harald Weinfurter and Dr. Wenjamin Rosenfeld have carried out measurements to test Bell’s inequality. Their results clearly contradict certain fundamental assumptions of classical physics. The study appears in the journal Physical Review Letters. “Nature is different from what we observe with our five senses”, says Harald Weinfurter. Bell’s inequality, introduced by the Irish physicist John Bell in 1964 can be used to test the validity of classical physics and their inconsistencies with quantum mechanics. In the world view of classical physics properties of objects exist independent of being observed (realism), and no information or physical influence can propagate faster than the speed of light (locality). However, the world of quantum particles is ruled by laws that are quite the opposite: two particles can be connected in a non-local way over large distances, and the property of a particle may not be defined until the instant it is being measured. Though all experiments so far have confirmed the predictions of quantum mechanics, advocates of local realism still found loopholes for their classical interpretation. “Simultaneous registration of the photons that were brought to interference heralds the entanglement of the two rubidium atoms,” Harald Weinfurter explains. Quantum entanglement of two particles implies a strong correlation of their properties. As a consequence, the spins of the two trapped rubidium atoms are expected to point into the same direction, or into the opposite direction, depending on the kind of entanglement. In a measurement run of eight days the scientists collected around 10.000 events. The analysis of the data showed, that far more atoms were in the same state (or in the opposite state respectively) than would be expected for a classical distribution. In fact, a violation of Bell’s inequality of more than 6 standard deviations was obtained. 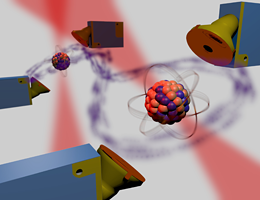 “We were able to determine the spin-state of the atoms very fast and very efficiently. Thereby we closed a second potential loophole: the assumption, that the observed violation is caused by an incomplete sample of detected atom pairs”, says Wenjamin Rosenfeld.